A rendering of a proposed sports stadium in downtown Boise. There’s a lot of want-to behind the effort to get a Boise Sports Park built. There’s a lot of want-to-not as well. But Boise State’s re-entry into the conversation could move the needle. BOISE, Idaho — Tuesday, April 16, 2019. The twists and turns in the Boise stadium saga have been epic. Last week, the Idaho Legislature threw a monkey wrench into Agon Sports & Entertainment’s and the city’s hopes of getting a stadium project done when it passed the law requiring public votes on the use of urban renewal money. This may not exactly be “Boise State to the rescue,” but the university released a statement Monday acknowledging that Greenstone Properties had asked it “to reconsider joining the effort.” Boise State said it has outlined a series of requirements that “could provide the financial and logistical incentive to consider joining” the project. Until then, the university is still working on its on-campus option as a home for the Broncos baseball program that begins play less than a year from now. It was almost a year and a half ago that Boise State pulled out of the Boise Sports Park originally planned for the old Kmart land on Americana Boulevard. But many have asked why the Boise Hawks and the Broncos couldn’t share a stadium since their seasons don’t overlap. The United Soccer League would be an issue, though, as its season began this year the second weekend of March. 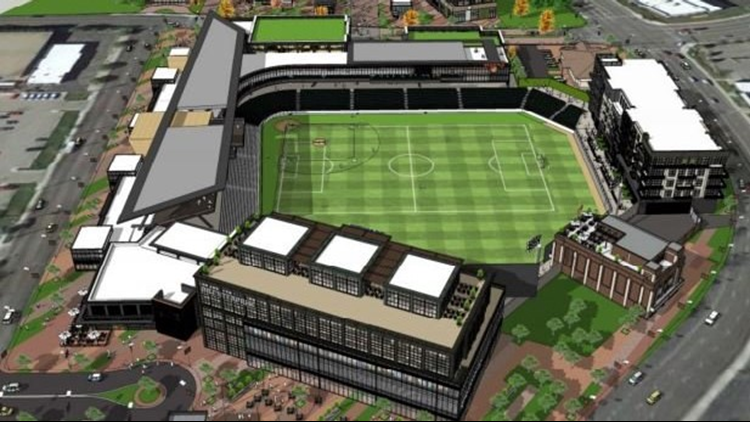 A USL franchise is conditionally set for Boise if the stadium project works out. Meanwhile, talking points listed by Boise State include “partial ownership, priority use, artificial playing surface, and shared revenues.” There are masses of torches and pitchforks out there opposing this project. Whether Boise State’s possible involvement in it will help change the dynamic remains to be seen. Boise State plays BYU on October 19. So the Broncos have six months to figure out who these new Cougars running backs are. South Carolina’s Ty’Son Williams announced over the weekend he’s headed for Provo as a grad transfer. The 6-0, 219-pounder was limited by injuries last season and rushed for only 328 yards in eight games. Williams joins Rice transfer Emmanuel Esukpa, who also played in eight games in 2018 and rushed for 461 yards. BYU is counting on Williams and Esukpa. The Cougars lost Squally Canada and Matt Hadley to graduation, and Riley Burr transferred, and their run game was inconsistent last season to begin with. BYU rushed for only 96 yards in its loss to Boise State on the blue turf last November, although that number was skewed by seven Bronco sacks of quarterback Zach Wilson. This can only help as the Idaho Steelheads try to recapture home ice advantage in the opening round of the Kelly Cup Playoffs. The Steelheads will have Brad McClure back in uniform more than two months after he was called up by the Texas Stars of the AHL. McClure was hot when the Steelies were their hottest this winter, scoring 19 goals with 20 assists in 42 games and notching five game-winning tallies. Despite his long AHL stint, McClure was still named Idaho’s Rookie of the Year this season. The Steelheads, tied with the Utah Grizzlies at a game apiece, play Game 3 Wednesday night in West Valley City. Boise’s Erik Teig finished 82nd overall Monday in the Boston Marathon. There were 30,000 runners in the 123rd edition of America’s most famous distance event. So Teig was in the top 99.7 percent. That’s pretty good. Teig completed the grueling course in 2:28.37. He’s a 35-year-old financial planner. I haven’t found Teig’s complete running portfolio, but he was the Race To Robie Creek champion in 2017 and has won the past two Redfish Lake Lodge Memorial half marathons. The Boise State beach volleyball team’s entire 2019 home schedule is compressed into two action-packed days this week on the Broncos’ sand courts at Belmont Street and Oakland Avenue. One of them is today—the Broncos Exhibition Pairs Tournament. It’s an all Treasure Valley-Magic Valley affair, featuring 22 pairs from Boise State, College of Idaho, Northwest Nazarene, Treasure Valley Community College and College of Southern Idaho. The sun is supposed to be out this afternoon. Speaking of which, you may have noticed the high Friday is forecasted to be 76 when the Broncos host Sacramento State and Arizona. Twigg was essentially the Kristin Armstrong of her day, enormously popular in the cycling world in the 1980s and ’90s. She loved the Women’s Challenge and was engaging to fans and media. I was the announcer for all the stages during the first race in 1984, and I think I still have a shirt Twigg autographed calling me “The Mouth.” I’m going to look for it. Anyone who remembers her is inclined to reach out and help her. But, as Greenstone writes, "She still won’t accept housing for herself, even when help is offered by people who’ve found out about her state.” Twigg doesn’t want “unfair advantages,” something that always made her feel guilty. “Help should be provided for everybody, not just a few,” she said. After a landmark 20-year career in the NHL, Wayne Gretzky announces his retirement. Gretzky’s pro career started at the age of 17 and peaked during his years with the Edmonton Oilers and L.A. Kings, as he won 10 NHL scoring titles. The Great One is hockey’s all-time scoring leader—by almost 1,000 points. Gretzky’s No. 99 is the only uniform number to be retired across the entire NHL.